Photo from a few days ago as Hugo Boss damaged section was cut away and the rebuilding process began. 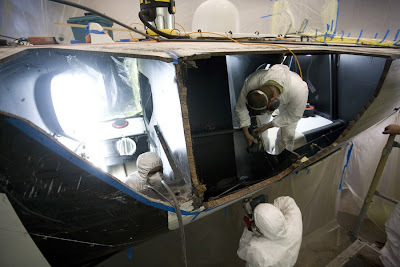 Update from the Hugo Boss repairs today: Boatworld: Significant progress, the outer carbon skin has been successfully laminated so the new hull section is fixed in place, and the high-density core is being fitted, ready for the the carbon inner skin to be applied tomorrow. Rigworld: A fairly big day for the riggers today as "two becomes one" so the two sections of the mast, with their new inner sleeves have been glued into place, and are joined together by the addition of two outer shells which will clamp around the inner sleeves, thus giving us a whole rig once again!